Most biofuels are still more costly than fossil fuels and thus production has to be encouraged e.g. by financial and organisational support. On the other hand measures are necessary to control negative environmental and social consequences such as shortage of nutritional crops, change in agricultural structures, or eradication of primeval forests. 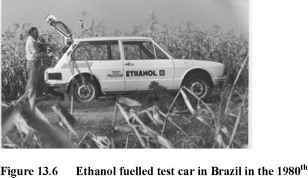 • Most stimulating for biofuels was the Brazil Proalcool bioethanol programme, launched after the energy crisis of 1973. 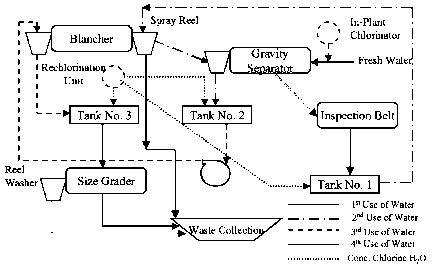 An extra aim was to use surplus sugar production. Sugar cane is the main source of bioethanol in Brazil. About two-thirds of the sugar cane biomass is processed into bioethanol. The commercial capacity is 400 facilities which currently produce a total of about 14 Mio t/a. This is now second largest national production in the world after decades in front-runner position. The costs of the ethanol production are in the range of 250 US$/m3 which is less than half the costs of bioethanol in Europe (450 to 500 EUR/m3). In Brazil currently all petrol is sold with an ethanol component of 20 to 26 percent (E25). One-half of the cars, a total of 14 Mio, are fuelled by E85 (see figure 13.6). Also pure ethanol (E100) is in use. Ethanol is 50 percent of the total national fuel market. A large share is exported. Refering to Biodiesel Brazil's current demand is 800 million liters. In 2008 the country imposed a two percent binding blend of biodiesel into regular diesel (B2). This is planned to go up to five percent (B5) in 2013. 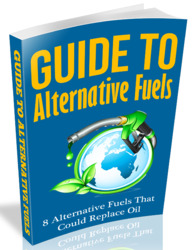 • The United States is now the world's largest bioethanol producer. Raw material is corn. A series of tax measures and incentives were followed by an exponential rise in production. In 2004 the Volumetric Ethanol Excise Tax Credit (VEETC) extended the existing tax incentives until 2010. In 2005, as part of a new energy bill, a Renewable Fuels Standard (RFS) was introduced, with a target rising production from 4 billion gallons in 2006 to 7.5 by 2012. EPA required a 3.71 percent blend of biofuels in 2007. The Energy Independence and Security Act which came into force in decembre 2007 includes a RFS calling for at least 36 billion gallons of ethanol to be used nationwide by 2022. Included is a national fuel economy standard of 35 miles per gallon by 2020, which will increase fuel economy standards by 40 percent. This will support the commercialization of bioethanol from cellulosic feedstocks such as native grasses, crop residues, forestry waste, and many other materials. The combination of domestically produced corn- and cellulose-based ethanol will replace a sig nificant portion of fossil fuel based gasoline. Domestic oil use will be reduced by 5 million barrels per day by 2030. This will save fuel costs of about US$ 160 billion annually by 2030 and reduce GHG emissions by 320 Mio t CO2-eq. annually (U.S., 2007). • EU commission in its Climate action and renewable energy package issued on January 23, 2008, sets a mandatory EU target of 20 percent renewable energy by 2020 including a 10 percent biofuels target (EU, 2008). This target is subject to production being sustainable, 2nd generation biofuels becoming commercially available and the Fuel Quality Directive being amended accordingly to allow for adequate levels of blending. The Commission, after assessment of the impact of achieving this goal, concluded that it would need significant additional funds but result in a massive reduction of EU dependence on oil imports, generate employment and reduce GHG emissions by 35 percent. No renewable crops will be accepted in areas with a high carbon stock or a high biodiversity value. • An enhanced contribution of renewables to the EU's total energy needs in the near future and the further development of the bioenergy market are very ambitious targets from an economic aspect, where investments into the technology of nearly EUR 165 billion are foreseen, and assuming that enough high yield cropland is available for energy crops instead of nutritional needs. Good agricultural practices including balancing of humus is necessary. In addition, future climate impacts on crops must be considered. Research provided evidence that the distribution of biofuel crops will increase in northern Europe and decrease in countries such as Spain, Portugal, southern France and Greece, due to increased drought. Mediterranean oil and solid biofuel crops will extend further north due to warmer summers. This shift will have dramatic consequences after 2080. The breeding of temperature and drought resistant plants is thus urgently necessary (Gill, 2006). between the Automotive Industry and the German government it was agreed to promote and implement biofuels into transportation energy strategies, according to German and EU quota regulations. New fuel qualities with higher blends of biofuels will be defined, 2nd generation biofuels will be promoted by R&D, demonstration facilities, as well as implementation activities, and international proposals will be prepared for a sustainable plantation of renewable crops. However the increasing fuel tax will propably reduce marketing chances for this type of fuel. • A number of non EU member countries have set targets for the incorporation of biofuels into conventional fuel. Amongst the measures, there are mandatory or fixed mixing percentages (e.g. Brazil, 25 percent mandatory; Canada: 3.5 percent target for 2010; in Ontario 5 percent for 2007), tax credits or incentives to biofuel producers or reduced fuel taxes (India: purchasing policy, 5 percent oil from indigenous plants in 2006, rising to 20 percent in 2020), or tax credits for vehicles (Brazil and Thailand: for cars run on biofuels; Thailand supports the development of a "Green vehicle") (EC, 2006).